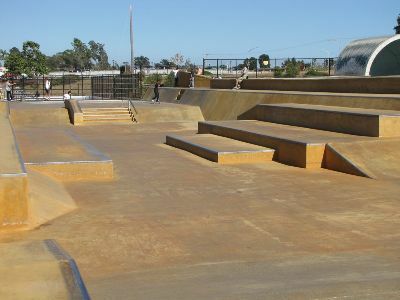 Made as almost a work of art, the Ken Wormoudt skate park is a monument to the surfing culture th at birthed skateboarding. 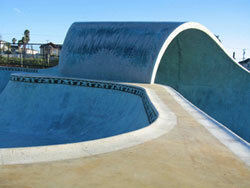 Two concrete bowls joined by a 17' full pipes, the whole park is made to look like waves. And, of course, there are rails, ledges, pool coping, hips and all to make it skateboard zen. Then there are is a pool style bowl, and a smaller bowl for the groms with a full stacked street course, too. This park is as fun to look at as it is to skate.